We’d love your help. 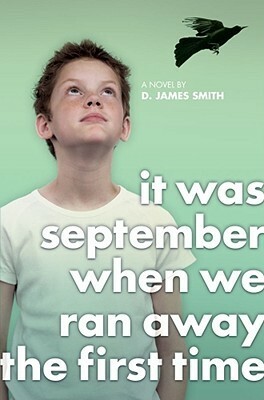 Let us know what’s wrong with this preview of It Was September When We Ran Away the First Time by D. James Smith. It's September, the first week of school at John Muir Junior High School, and Paolo has a lot on his mind. He's thinking about finding a place of his own with his brother Georgie and his cousin Billy, running away part-time -- which means they are running away, but still come back home to eat and sleep and read the paper. He's thinking about the upcoming Halloween/All Saints' Day/Mexican Day of the Dead/Chinese Lantern Night carnival, and what booth he, Georgie, and Billy would like to man. He's thinking about Communism and the atom bomb, just like everyone else in Orange Grove, California, in 1951. But most of all, he's thinking about Billy and Veronica, a Chinese girl in his class, who have both become victims of some ofthe community's ignorant but deep-seated ideas about who should be hanging out with whom. And it's this last thought that Paolo, even with Georgie and Billy's help, can't quite figure out. Suddenly, the boys have a real reason to be running away, and maybe not just part-time. To ask other readers questions about It Was September When We Ran Away the First Time, please sign up. Another point of interest to me is the hi This trilogy (So far) really intrigues me! I stumbled upon one of D. James Smith's books way back when I started my blog. I accidently read the second book before the first, but it didn't matter. Now there is a third story about Paolo and his Italian-American family. This is my own title. It received rave reviews and is selling well. Last in a series I wrote, beginning with The Boys of San Joaquin which won an Edgar. Solid, wholesome, funny, book for teens and pre-teens. A recipient of an NEA fellowship in poetry and the Edgar Allan Poe Award in fiction, D. James Smith’s poems and stories have appeared recently in The Malahat Review, New Millennium Writings & The Notre Dame Review. His books include the novel My Brother’s Passion (Permanent Press, 2004) and two collections of poems, The Dead Ventriloquist (Ahsahta Press, 1995) and Sounds The Living Make (S. F A recipient of an NEA fellowship in poetry and the Edgar Allan Poe Award in fiction, D. James Smith’s poems and stories have appeared recently in The Malahat Review, New Millennium Writings & The Notre Dame Review. His books include the novel My Brother’s Passion (Permanent Press, 2004) and two collections of poems, The Dead Ventriloquist (Ahsahta Press, 1995) and Sounds The Living Make (S. F. Austin State Univ., 2012). He has also published four novels for teens: Fast Company, The Boys of San Joaquin, Probably The World's Best Story About a Dog and the Girl Who Loved Me, and It Was September When We Ran Away. (DK, 1999; Atheneum, 2005, 2006, 2008).